The Lexus RC looks like a sports car, but drives like a limousine. It’s comfort over performance, and the price tag is hard to swallow. What do you need to know before you buy a Lexus RC? Don’t worry, we’ll tell you everything right here in the Ultimate Buyer’s Guide. That big spindle grille and those sharp headlights might make you think the Lexus RC is a monster on the track. It looks fast, so it must be fast, our minds trick us into thinking. But the Lexus RC isn’t about track performance, it’s all about looking good, providing a smooth and comfortable ride, and spoiling its occupants with fancy gadgetry. And there’s nothing wrong with that, though competition from Audi, BMW and Cadillac make the RC a tough sell. The Lexus RC comes in many flavors, and those flavors dictate how the car looks, drives and feels. The car we drove was an RC 350 AWD model, with a 3.5L V6 making 306 horsepower. The acceleration is smooth, predictable, and linear all the way through the rev range, with the 6-speed transmission doing a good job predicting when it needs to downshift. The car’s curb weight of nearly 4,000 pounds makes it heavier than competition from Cadillac or BMW, and it shows. You wouldn’t describe the RC 350's handling as “nimble,” though the V8-powered, enthusiast-oriented RC F, while similarly obese, does promise better dynamic performance. Luckily, regardless of trim level, the RC comes with quite possibly the best seats out of any car we’ve tested. We understand every seat fits every person differently, but we can tell you the seats are a match made in heaven for someone in the 6'1" 175-pound range. The suspension is supple enough to ingest an NYC pothole, yet stiff enough to make a roundabout moderately exciting. Where the RC excels though, is the highway. The RC effortlessly soaks up the miles, regardless of road quality or condition, and when paired with those seats, you can drive for 5, 6, 7 hours at a time before having to get out and stretch your legs. That’s where the RC feels most at home. ...I’m telling you (as a tech-savvy young dude), it’s incredible. To scroll just move your finger on the surface and to click, push the whole thing in like a MacBook trackpad. It has haptic feedback which, unlike the Blackberry Storm 2 (anyone?) never gets annoying and the pad seems to rest perfectly at the end of the driver’s fingertips. It made navigation inputs, Bluetooth setup, and all the other seemingly tedious tasks when plugging into a vehicle a breeze. So it’s more of a smooth sailer than an agile fighter pilot, but that can be a good thing, especially if comfort is your priority. The Lexus RC Coupe launched for the 2015 model year, offering only a single trim, RC 350, which could be had in rear or all-wheel drive. Both trims got the same 306 horsepower 3.5-liter V6, though the all-wheel drive model had to do with two fewer cogs in its six-speed transmission. The new 2015 RC promised to “[meld] audacious design and high performance like no Lexus before,” and Lexus said the new model was a standalone model, not simply a sedan with the roof shopped down. Still, the front section is based on a GS, the middle of the car is based on the Lexus IS C, and the rear floor is based on the new IS sport sedan. It’s basically a hodgepodge of Lexuses. The new RC 350's “ultra stiff platform,” LFA-inspired interior and aggressive concept-car like design culminated in a performance coupe that Lexus called “Fast. Agile. Daring.” A rear-drive F Sport RC 350 trim was also available. It offered Adaptive Variable Suspension, a unique interior and exterior design features. The RC F also launched for the 2015 model year. It represented the return of Lexus’s sporty F models after the departure of the IS F and LFA. Standing for Fuji Speedway where Lexus does its high-speed development, the new F was wider, longer and lower than the RC on which it was based. It got a big V8 engine, an aerodynamic and aggressive exterior design, a limited slip diff, bigger brakes, performance-tuned suspension, and plenty more go-fast goodies. The 2016 model year brought two new variants to the RC lineup: RC 200t and RC 300 AWD. The RC 200t got a 241-horsepower 2.0-liter turbo inline four mated to an eight speed auto, and the RC 300 AWD got a 255 horsepower version of the 3.5-liter V6 in the RC 350 mated to a six-speed auto. The 200t becomes the new base model, and the RC 300 AWD becomes the least-expensive all-wheel drive variant. In addition, a limited slip differential, performance dampers and orange brake calipers are become options for the RC 200t and RC 350 FWD F Sport. Lexus offers the RC with three different engines: a 2.0-liter turbo, a 3.5-liter V6 or a 5.0-liter V8. The 2.0-liter found in the RC 200t makes 241 horsepower, while the 3.5-liter makes either 255 horsepower in the RC 300 AWD or 306 horsepower in the RC 350 and RC 350 AWD. The beast of the group, though, is the RC F, whose naturally aspirated 457 horsepower 5.0-liter V8 shoots the car to 60 MPH in just 4.4 seconds. That’s not quite M4 or ATS-V quick, but it’s quick nonetheless. All RC models get eight-speed automatics except for the all-wheel drive models, which send power through six-speed autos. Though the RC F is the fastest RC by a large margin, acceleration figures are good across the board. The RC 200t, the least powerful model, gets to 60 MPH in 7.3 seconds, while the slightly more powerful RC 300 AWD runs to 60 a full second quicker. The 350 RWD makes the sprint in 5.8 seconds, and the heavier all-wheel drive version gets there in six seconds flat. There are no slow Lexus RCs. Fuel economy figures aren’t impressive, but they’re not at the back of the pack, either. The RC 200t scores 32 MPG highway and 26 combined. That’s the same as the less powerful Audi A5 and the slightly more powerful ATS, but markedly lower than the 240 HP BMW 4 Series. The V6 fuel economy figures aren’t great. Not even the two-wheel drive models can score 30 MPG highway, meaning competition from Audi, Cadillac and BMW scores better. The burly 457 horsepower RC F, on the other hand, does pretty well on the emission rolls, besting the numbers made by Cadillac’s ATS-V and Audi’s RS5, and sitting only a smidgen below the less-powerful M4's fuel economy figures. The Lexus RC Coupe comes in eight main trims: RC 200t RWD, RC 300 AWD, RC 350 RWD, RC 350 AWD and their F Sport variants. Lexus also offers a performance-oriented RC model called the RC F.
Steering for all RCs is electric and suspension is a double wishbone setup in the front and a multilink independent setup out back, with coils at all four corners. Brakes on the RC 200t, RC 300 AWD and RC 300 AWD F Sport are 11.7-inch vented rotors up front and 11.4-inchers in the back. The other five RC Coupe trims receive 13.15-inchers in the front and 12.2-inch vented discs out back, while the RC F gets even bigger stompers: 14.9-inch slotted and vented rotors grabbed my six piston calipers and four-piston calipers squeezing 13.5-inch slotted and vented rotors in the back. RC 200t: Starts at $39,995. Notable standard features: 241 horsepower turbo I4, eight-speed automatic with paddle shifters, 18-inch alloy wheels, selectable drive modes, dual-zone climate control, NuLuxe vinyl interior trim, tilt and telescoping steering column, power front seats, backup camera, 256 watt 10-speaker audio system, seven-inch infotainment screen, Bluetooth, LED auto-leveling headlights, heated mirrors. Notable options: Luxury Package: perforated leather-trimmed seats, rain-sensing wipers, heated and vented front seats, power tilt and telescoping steering wheel, Lexus Memory System, Blind Spot Monitor with Rear Cross-Traffic Alert, auto dimming outside mirrors ($2,990); Navigation Package: remote touchpad, Navigation system, CD/DVD player ($1,530); Premium Package: Heated and vented front seats, blind spot monitor with Rear Cross Traffic Alert, auto-dimming outside mirrors ($1,240); All-Weather Package: headlamp washers, windshied wiper de-icer, high-intensity interior heater, water-repellent front-door glass ($220); 19-inch wheels with summer tires ($795+Premium Package); LED foglamps ($410); parking proximity sensors ($500); Pre-Collision System with all-speed Dynamic Radar Cruise Control ($500); Blind Spot Monitor with Rear Cross-Traffic Alert ($600). RC 200t F Sport: Starts at $44,100. Notable standard featuresover RC 200t: Premium Package, unique fascia and full-faced mesh grille, 19-inch alloy wheels, sport mode, sport-tuned suspension, aluminum pedals, unique steering wheel and shift knob, unique interior trim, high performance brakes, Lexus memory system, power tilt and telescoping steering wheel. Notable options: Navigation/Mark Levinson Audio Package: 17-speakers, subwoofer, remote Touchpad, Navigation System, CD/DVD player ($2,610); Navigation Package ($1,530); All-weather package ($220); Power moonroof ($1,100); LED foglamps ($410); parking proximity sensors ($500); Pre-Collision System with all-speed Dynamic Radar Cruise Control ($500). RC 300: Starts at $42,610. Notable standard features over RC 200t: 255 horsepower 3.5-liter V6, six-speed automatic, all-wheel drive, heated front seats. Notable options: Luxury Package: Perforated leather-trimmed seats, rain-sensing wipers, heated and vented front seats, heated steering wheel, power tilt and telescoping steering wheel, Lexus Memory System, Blind Spot Monitor with Rear Cross-Traffic Alert, auto dimming outside mirrors($2,700); Navigation/Mark Levinson Audio Package ($2,610); Navigation Package ($1,530); Premium Package: heated and vented front seats, Blind spot monitor with Rear Cross-Traffic Alert, auto-dimming outside mirrors ($800); All-weather package ($220); LED foglamps ($410); parking proximity sensors ($500); Pre-Collision System with all-speed Dynamic Radar Cruise Control ($500); Blind Spot Monitor with Rear Cross-Traffic Alert ($600). RC 300 F Sport: Starts at $46,310. Notable standard features over RC200 F Sport: 255 horsepower 3.5-liter V6, six-speed automatic, all-wheel drive. Same options as RC 200t F Sport. RC 350 AWD Starts at $45,015. Notable features over RC 350: six-speed automatic, all-wheel drive with heated front seats. Similar options as RC 300. RC 350 F Sport: Starts at $46,885. Notable standard features over RC 200t F Sport: 306 horsepower 3.5-liter V6, eight-speed automatic. Notable options: Lexus Dynamic Handling System INcluding Dynamic Rear Steering ($1,900); Navigation Package ($1,530); Power moonroof ($1,100); LED foglamps ($410); parking proximity sensors ($500); Pre-Collision System with all-speed Dynamic Radar Cruise Control ($500). RC 350 F Sport AWD Starts at $48,715. Notable features over RC 300 F Sport: 306 horsepower 3.5-liter V6. Similar options as RC 300 F Sport. RC F: Starts at $62,805. Notable standard features: 467 horsepower 5.0-liter V8, eight-speed automatic, Torsen limited slip rear differential, performance Brembo brakes, sport-tuned suspension, unique gauge cluster, Michelin Pilot Sport PS2 tires, 19-inch alloy wheels, dual exhaust, LED lights all the way around, NuLuxe interior with unique embroidery, power front sport seats with memory, automatic climate control, seven-inch infotainment monitor, 10-speaker 256W audio system, Bluetooth. Notable Options: Performance Package: torque vectoring differential, carbon fiber roof, carbon fiber rear wing, heated and vented front seats, auto-dimming outside mirrors, rain-sensing wipers, Blind spot monitor with Rear Cross-Traffic alert, parking sensors, Lexus memory system, triple-beam LED headlamps, black carbon fiber interior trim ($5,500); Premium Package: Heated and vented front seats, rain-sensing wipers, park sensors, triple-beam headlights, auto-dimming outside mirrors, advanced Blind Sport Monitor with Rear Cross-Traffic Alert, Lexus Memory System, black carbon fiber interior trim ($4,400); Navigation/Mark Levinson Audio Package ($2,840); Leather interior trim ($800+Premium Package); Power moonroof ($1,100); parking proximity sensors ($500); Pre-Collision System with all-speed Dynamic Radar Cruise Control ($500); triple-beam LED headlamps ($1,160). The Lexus RC is relatively pricey. Cars with similar ride comfort, but more handling prowess seem to offer more for less. Take the $41,850 BMW 428i. 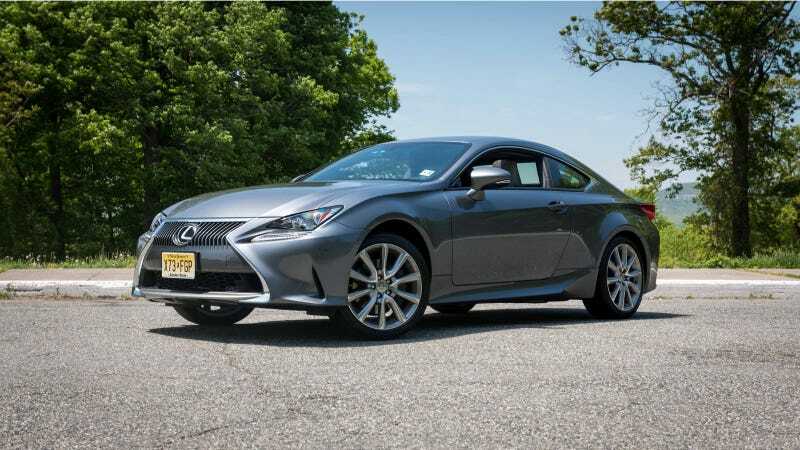 Its 240 horsepower turbo I4 might lead you to think it competes with the cheaper but similarly equipped Lexus RC 200t. But the 4 Series’s acceleration figures (5.7 seconds to 60 MPH) are actually up there with the $42,780 RC 350. And the 428i comes similarly equipped to the RC 350. Then there’s the Cadillac ATS Coupe, which is not only two grand cheaper than the base RC, but also offers more straight-line and handling performance, and similar standard equipment. So at its suggested retail price, RC isn’t the best value in the class, but if we could snag a killer deal on one, we’d have no qualms with driving the RC 350 on road trips. It’s thoroughly cozy on the freeway.